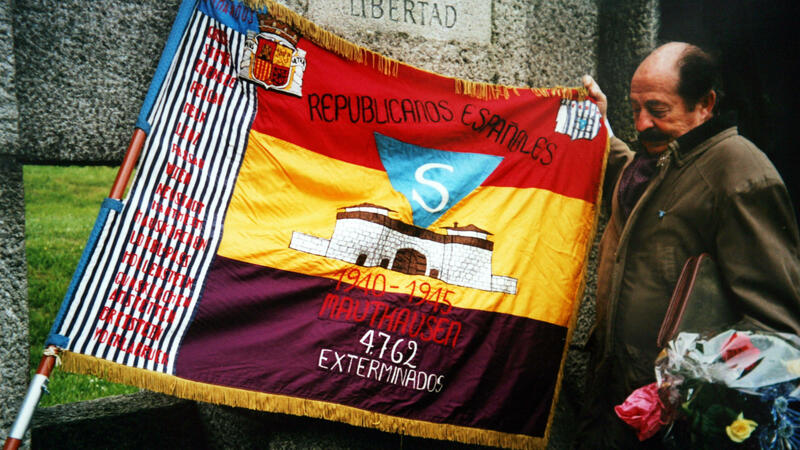 Enric Marco stands next to a Spanish Republican flag at Mauthausen camp in Austria in May 2003. Marco, who was chairman of an association of Spanish Republicans deported from France to Nazi concentration camps during World War II, admitted in May 2005 that his tale of surviving the Flossenbuerg camp was a lie. His book The Impostor, which he describes as a "novel without fiction", explores the facts of Marco's life and the reasons behind his lies. Cercas says Marco thought the novelist would justify him. "I mean lots of people did that. I mean, there were very intelligent people who — when the case broke out in the media — said 'well what Marco did was bad because he lied ... but, you know, he did it for a good cause, right?' "
His book places Marco face to face with the truth. Cercas broke down that process and his journey in an interview with All Things Considered's Ari Shapiro. To have a good lie, to cheat everybody, you have to put some truth in it. Right? It has to have the flavor of truth, right? And it was like that in Marco's case — behind all his lies there was a tiny truth. ... And that's why it was so difficult to get into the real story of this man. That's what I tried to do in the book. This guy did something really, really bad, which is to lie about the worst crime probably in the history of humanity. But I don't justify him — and that's why he was mad at me when he read the book — but to understand is the contrary to justify. It's to give us the instruments so we don't repeat the same mistakes. On how "only an impostor could write about an impostor"
I would say he's like a monstrous exaggeration of what we are. One important question in the book is why he did that, and of course there are many answers to that question. But one of them is that, he did that because he wanted to be loved. And of course we all do many things to be loved. I mean, I write to be loved, as García Márquez said once — and probably you are on the radio because you want to be loved! ... But he did without respecting the rules we more or less try to respect, beginning with the rule to tell the truth. My relationship with him changed along the book. At the beginning I felt, like, disgusted with him — and I hated him, in fact. But then, slowly I become more close to him, and I begin to understand him. And — I don't know, that was disturbing for me. The reader, he must decide what to do with Marco. He must decide if he's also an impostor or if he's not. We are all a bit, right? We are not as great as impostors as Marco, but we play the same game. Kat Lonsdorf and Jolie Myers produced and edited this interview for broadcast. Cameron Jenkins adapted it for the Web. In Spain, everyone knew the story of Enric Marco. He presented himself as a Holocaust survivor, a Spanish Civil War hero, a resistance fighter against the oppressive regime of Francisco Franco. He spoke in schools and gave public speeches and countless interviews. Marco offered himself as a sort of national conscience for Spain, except it was all a lie. In 2005, a historian unmasked Marco as a fraud. That revelation set Spanish writer Javier Cercas on a quest to reveal Marco's real past and to figure out why he lied. Cercas is a novelist, and he describes his new book as a novel without fiction. It's titled "The Imposter." When I spoke with Cercas, I asked him, how did Enric Marco fool so many people for years? JAVIER CERCAS: The best lies are not pure lies. To have a good lie and to cheat everybody, you have to put some truth in it, right? It has to have the flavor of truth, right? And it was like that in Marco's case. You know, behind all his lies, there was a tiny truth. SHAPIRO: So for example, he was locked up by the Germans. SHAPIRO: He just wasn't in a labor camp as a victim of the Nazis. CERCAS: Exactly. That's a good example. So behind all his lies, there was some truth. And that's why it was so difficult to get into the real story of this man. That's what I tried to do in the book. SHAPIRO: You wrestle in this book with whether it is possible to write about somebody without in some way glorifying or excusing him. And obviously you made the decision that this is possible because you've written the book. How confident are you that you made the right decision now that the book is published and complete and out there? CERCAS: I'm confident because I think that one thing is to understand and another thing is to justify. It's two different things. We - as human beings, we must do is to understand - to understand everything, even the worst things. I mean, this guy did something really, really bad. I mean, just to lie about the worst crime probably in the history of humanity, but I don't justify him. And that's why he was mad at me when he read the book. But to understand is the contrary to justify. It's to give us the instruments so we don't repeat the same mistakes. SHAPIRO: He cooperated with this book. He knew what you were writing. You were transparent about your project. And still, you say he was mad at you when he read the book. Explain that. CERCAS: Yeah, because he thought that I was going to justify him. I mean, lots of people did that. I mean, there were very intelligent people who, when the case broke out in the media, said, well, what Marco did was bad because he lied. But, you know, he did it for a good cause, right? SHAPIRO: To educate people about what happened, even if he hadn't actually lived through it as he was claiming. CERCAS: Exactly, but that was obviously [expletive] because Marco's version was not real history. It was a romantic one, was a - you know, a version that people loved. SHAPIRO: Part of you clearly identifies with him. You are a novelist. You make up stories for a living. At one point in the book, you write only an impostor could write about an impostor. Tell me about how you struggled with that identification and how you overcame it to write this book that ultimately exposed him as a fraud? CERCAS: Well, that's a very good question. I mean, one of the worst things of writing this book was to realize that I was not different from this guy, that we share a common humanity with him. He's - like, I would say he's like a monstrous exaggeration of what we are. One important question in the book is why he did that. And of course there are many answers to that question, but one of them is that he did that because he wanted to be loved. And of course we all do many things to be loved. I mean, I write to be loved. That's what Garcia Marquez said once. And probably, you are on the radio because you want to be loved. CERCAS: But I guess I don't know. SHAPIRO: We've only just met. CERCAS: I don't know. But he did it without respecting the rules that we more or less try to respect, beginning with the rule to tell the truth. SHAPIRO: There's a pattern in this book where Marco repeatedly lies to you, and you repeatedly confront him with evidence that he has been lying to you. And there's one moment where you describe him putting his elbows on the table and his face in his hands. And he whispers, please leave me something. Tell me about that moment. CERCAS: That's a difficult moment. I would say the worst moment of our relationship because, you know, my relationship with him changed along the book. You know, at the beginning, I felt, like, disgusted with him and I hated him, in fact. But then slowly, I became, you know, more close to him. I began to understand him, and I don't know. That was disturbing for me. The reader, he must decide what to do with Marco. He must decide if he's an - also an impostor or he's not. We are all Enric, right? We are not as great as impostors as Marco, but we play the same game. SHAPIRO: Javier Cercas, thank you so much for talking with us today. CERCAS: Thank you very much. SHAPIRO: His new book is called "The Imposter: A True Story." (SOUNDBITE OF THAO WITH THE GET DOWN STAY DOWN SONG, "TROUBLE WAS FOR") Transcript provided by NPR, Copyright NPR.